A searing act of bioterrorism. A catastrophic plague they call the Pretty Pox. Most of the human race is dead, and for two years Arie McInnes has been alone, riding out the aftermath of the Pretty Pox, waiting for her own inevitable end. Hidden in the attic of her ruined home, Arie survives by wit and skill, ritual and habit. Convinced that humans are a dangerous fluke, a problematic species best allowed to expire, she chooses solitude…even in matters of life and death. Arie’s precarious world is upended when her youngest brother – a man she’s never met – appears out of nowhere with a badly injured woman. Their presence in the attic draws the attention of a dark watcher in the woods, and Arie is forced to choose between the narrow beliefs that have sustained her and the stubborn instinct to love and protect. In Book One of August Ansel’s captivating new post-apocalyptic series, After the Pretty Pox casts an unwavering eye on what it means to be human in a world where nature has the upper hand, and the only rules left to live by – for good or ill – are the ones written on our hearts. 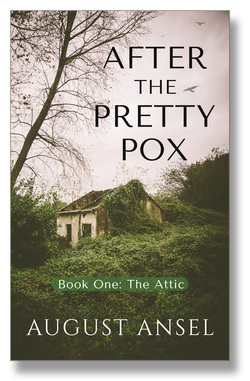 AFTER THE PRETTY POX: THE ATTIC is now on sale! Also available free to subscribers of Kindle Unlimited.